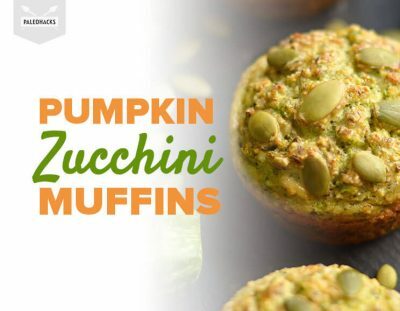 Sneak in some veggies with breakfast and whip up these Savory Pumpkin Zucchini Muffins! 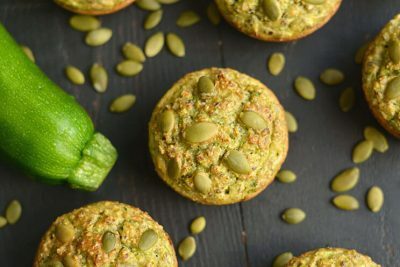 Made with just seven ingredients, these pumpkin zucchini muffins are grain-free, gluten-free and sugar-free. The secret to these amazing muffins? There’s a hint of garlic and salt that creates an extra savory flavor (trust us on this one), while the shredded zucchini gives the muffins a moist, soft texture. To balance it all out, ground pumpkin seeds bring a subtle, satisfying crunch to every bite. What you get is a muffin that’s dense, chewy and filling! Perfect for curbing those midday cravings. This savory muffin recipe takes just 15 minutes to prep. Grinding the pumpkin seeds and shredding the zucchini in a blender make the work easy. From there, you simply whisk together the remaining ingredients, pour the batter into a muffin tin and wait 30 minutes for them to plump up. When they’re golden brown, that’s when you know they’re ready! Preheat the oven to 350°F. Prepare a muffin tin by lightly greasing with melted coconut oil. In a blender, blend the pumpkin seeds until roughly ground. Transfer the pumpkin seeds to a medium mixing bowl. Set aside. Place the chopped zucchini in the blender and gently pulse to shred. Transfer shredded zucchini to the mixing bowl with the ground pumpkin seeds, then add the eggs. Whisk the three ingredients together until eggs are broken down. Add flax meal, salt, garlic powder and tapioca powder to the mixing bowl. Whisk together until ingredients are well combined. Transfer the batter to the prepared muffin tin, evenly dividing it into 6 cavities. Place 4-5 extra pumpkin seeds on top of each muffin. Press them gently into the batter to set. Bake for 30 minutes until the edges are golden brown. Remove from the oven and transfer muffins to a wire rack to cool. Tip: These baked treats can be paired with breakfast or served as a snack. My personal favorite is spreading grass-fed butter on these muffins with a cup of coffee.